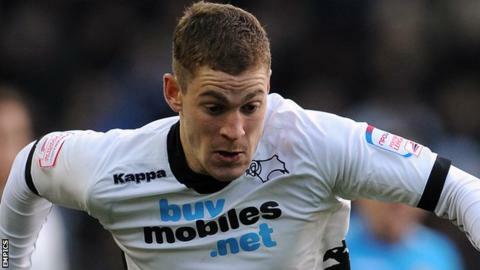 Derby County midfielder Paul Coutts says he is "delighted" to be back playing after 13 months out injured. The 26-year-old came off the bench during Tuesday's League Cup win over Fulham, having been out since dislocating his kneecap last September. "I'm absolutely delighted. It's been hard work and a long road back so I'm chuffed to get back out there," Coutts told BBC Radio Derby. "Injuries are part of football. You've just got to work hard and battle back." The Rams had trailed 2-0 at Craven Cottage, but goals from Chris Martin, Johnny Russell, Jeff Hendrick and Simon Dawkins saw them come back to book their place in the quarter-finals. "It was a superb second-half, the lads really showed their character and got a few goals and thankfully the gaffer put me on and gave me a run out," added Coutts. "The coach is very calm and tactically very good but the boys knew in the first half they needed to up it - and in the second half they did."